Happy Halloween! Our weather has been far from dark and gloomy today. The weather has been picture perfect, with plenty of sunshine and very comfortable afternoon temperatures. It will be hard to not get out and trick or treat on this Halloween as evening weather conditions will be excellent. It may be a bit chilly starting around 8:00 and I’m expecting lows to drop into the middle 40s. The weather outlook over the next 3 to 4 days looks very dry. Each day we will have ample sunshine, with highs reaching the comfortable middle 70s. A cold front will move through early tomorrow and the only thing we will experience is a shift in wind direction. A reinforcing shot of cool dry air will settle in and this will mean seasonal temperatures through the weekend. The only major storm system near the southeast is a tropical storm over Cuba. Noel continues to slowly make a turn towards the Bahamas. The system will later make a turn northeastward into the Atlantic, away from land. The only impacts to the U.S will be coastal erosion along Florida’s East Coast. Beyond the weekend, the data continues to point at a very cold air mass invading the country next week. By next Thursday a shallow layer of very cold air will sink southward towards Alabama and we will quite possibly see our first round of freezing temperatures by next Thursday or Friday morning. There could be a stray shower along with a few clouds as this cold air approaches on Tuesday; otherwise, not much rain at all is expected. Be sure to join us at five, six, and ten for more details! Good Afternoon! The satellite imagery over Alabama today reveals a few clouds over the central part of the state, with a broad shield of clouds over extreme south Alabama. We will continue to have lots of sunshine this afternoon, with temperatures warming into the lower 70s. I’m still expecting the sky to be clear tonight, which means another big cool down into the low 40s…upper 30s will be possible in some spots north of Tuscaloosa. The data has been advertising a couple of frontal passages this week, which will reinforce the cooler air in place. I’m expecting the first front to arrive late tomorrow night and early Thursday. This will bring a slight increase in clouds tomorrow night, but the lack of energy will mean rain free conditions tomorrow night. Therefore, all the little trick-or-treaters need to plan on bundling up for the chilly evening temperatures. The front will quickly move through early Thursday, with more sunshine expected. Highs will stay in the 70s, with lows in the 40s. During the Thursday timeframe the tropical system Noel, pronounced “NOL”, will be taking a turn northeastward out of the Bahamas Islands Chain. This system is currently positioned over the western part of Cuba and the system will be tracking into the Bahamas over the next 24-48 hours. The dry weather will be continuing over the weekend and we will continue to experience a seasonal fall air mass. Highs will stay in the 70s, with lows in the 40s. High pressure will become centered over the region this weekend and this will set the stage for very calm and crisp fall weather. Once the high slides east early next week another cold front will move in during the Tuesday/Wednesday timeframe. This boundary will bring an increase in clouds along with a small chance for rain. I will need to see a couple of more model runs before I completely accept the magnitude of the cool down advertised by the data. The latest guidance is suggesting a big time blast of cold air late next week, with freezing temperatures possible by Thursday morning of next week. Stay tuned as we continue to fine-tune our long-range weather outlook. The above image was sent to us by UA Astronomy Professor Bill Keel. 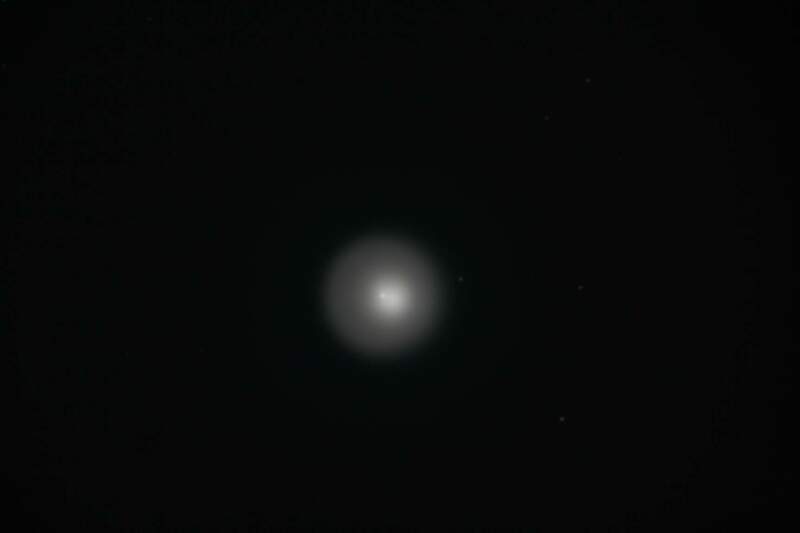 The bright object in the middle of the image is the Comet Holmes, which is undergoing a dramatic outburst. This comet has a circumference of illumination as large as the Planet Jupiter. The comet will not appear as bright as the Planet Jupiter, but it will be visible to the unaided eye, by looking north after sunset. It will appear as a hazy-visible-star in the constellation Perseus. For a detailed star chart and more information click here. We started the day on a cold note, with an official morning low of 44-degrees in Tuscaloosa. Look for a recovery to near 70-degrees for an afternoon high, with a mostly sunny sky overhead. As we finish the month of October, dry weather will be the story. We will have lots of sun for tomorrow and Halloween, with cold mornings and comfortable afternoons. The little ghosts and goblins won’t have to worry about being forced stay indoors Halloween night due to weather. In fact, the weather will stay calm right on through the rest of the week. A couple of cold fronts will move through the region this week. Both fronts will be rain free but they will bring us reinforcing surges of cool/ dry air. One boundary will arrive during the Wednesday/Thursday time frame and another over the weekend. Once again, I’m not expecting rain: however, you will need to keep the jackets handy, with cold overnight temperatures expected. Look for a partly to mostly sunny sky for the next several days, with clear nights. Even though we’re shifting into that cold weather mode, it’s still hurricane season. Yesterday Tropical Storm Noel formed near Haiti and the system is currently moving across that island, spreading heavy rain’s to both Haiti and the Dominican Republic. The system is forecasted to be a tropical storm as it churns towards the Bahamas and then later turns out to sea on Thursday. If you are looking for nice weather, Alabama is the place to be! I hope you are having a great Sunday! Today was another picture-perfect day, with sunny skies and a cool breeze out of the north. Tonight, temperatures will quickly drop off into the upper 40s for lows, with clear skies in place. This will be the pattern over the next 5 to 7 days, as we will see cold nights, followed by warm and sunny afternoons. Things will remain very tranquil for a while, with a nice fall like pattern in place. Also, for Halloween, our spooky forecast doesn’t look spooky at all. Highs on Wednesday will be in the middle 70s, with lots of sun. For all of the trick-or-treaters heading out Wednesday night, you will need to bundle up because temperatures will quickly drop after the sun sets. We have a very dry air mass in place, so our temperatures will heat and cool very rapidly. A look into November shows no big changes anytime soon. Highs on Thursday, Friday and Saturday look normal this time of the year, with lots of sunshine across the area. However, things do look very interesting in about 10 days out, with a setup for rain and much colder temperatures afterwards. The tropics have begun to heat up once again. We are now watching Tropical Storm Noel. The 5 p.m. advisory on this storm has winds sustained at 60 mph and was situated very close to Haiti. Noel has been undergoing a stage of rapid development, but with it’s proximity to the mountainous terrain of Cuba and Haiti, it is unlikely that it will strengthen much more tonight. The big question is will it impact the U.S. Mainland? As of now, the projected track from the National Hurricane Center turns Noel out to sea before making much of an impact to Florida. Our friends in South Florida will need to keep a close eye to this storm as it moves close by. Be sure to tune tonight at 10 p.m. for the latest on Noel and your home team forecast. FOR STORM INFORMATION SPECIFIC TO YOUR AREA…INCLUDING POSSIBLE INLAND WATCHES AND WARNINGS…PLEASE MONITOR PRODUCTS ISSUED BY YOUR LOCAL WEATHER OFFICE. THE DEPRESSION IS MOVING TOWARD THE WEST-NORTHWEST NEAR 6 MPH…AND THIS GENERAL MOTION IS EXPECTED TO CONTINUE DURING THE NEXT 24 HOURS. EVEN THOUGH THE CENTER OF THE DEPRESSION COULD PASS SOUTH OF HISPANIOLA…HEAVY RAINS TO THE NORTH AND EAST OF THE CENTER WILL PASS OVER THE DOMINICAN REPUBLIC AND HAITI DURING THE NEXT 24 TO 36 HOURS. AIRCRAFT IS SCHEDULED TO INVESTIGATE THIS SYSTEM THIS AFTERNOON. ESTIMATED MINIMUM CENTRAL PRESSURE IS 1003 MB…29.62 INCHES. I hope you are having a great Saturday! Things turned out nice today after a very cold start to the morning. Our low this morning was 38 degrees! With sunny skies this afternoon, temperatures quickly warmed into the upper 60s. Tonight, you can expect another cold night for our area; lows will drop into the upper 40s, with a light north wind. Much like today, temperatures will quickly rebound once the sun is out in full force; highs tomorrow afternoon will be in the low 70s, but with a north wind in place, it will feel a little chilly outside. With a very dry air mass in place and clear skies, temperatures will drop into the upper 40s again tonight. The beginning of this work-week looks very nice; highs will be in the low 70s, under mostly sunny skies. This nice weather will continue into Halloween, with highs Wednesday in the middle 70s. If you plan on being outdoors Wednesday night, be sure to bundle up because temperatures will quickly drop into the upper 40s after dark. A sneak peak into November shows the nice weather continuing; highs Thursday and Friday will be in the middle 70s, with partly cloudy skies around the area. Looking ahead, I don’t see another good chance of rain until next Monday, with an upper-level-low moving our way. This could set the stage for similar conditions we saw a few days ago, with cloudy, cold and rainy weather. Then, some models are picking up on a change to much colder weather after that. Of course, this is well out into the future, and skill in a forecast past 7 days is not very good. Be sure to stay tuned for more weather updates.